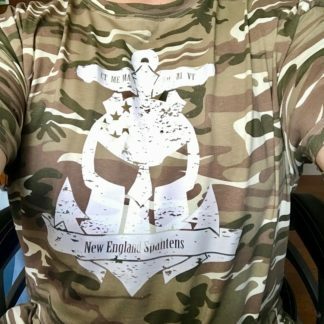 Take a listen as Paul, Josh and Sandy cover the past couple of weeks of New England OCR – talking about Rugged Maniacs return to Southwick, MA for the *7th* year in a row – why O2X is more than “just a trail race” and a special long segment discussing the upcoming OCR World Championships in Canada! 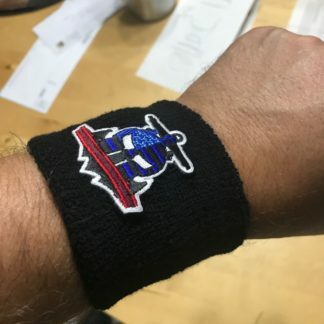 We also take listener questions from Chris, Greg and Rob – thanks guys! 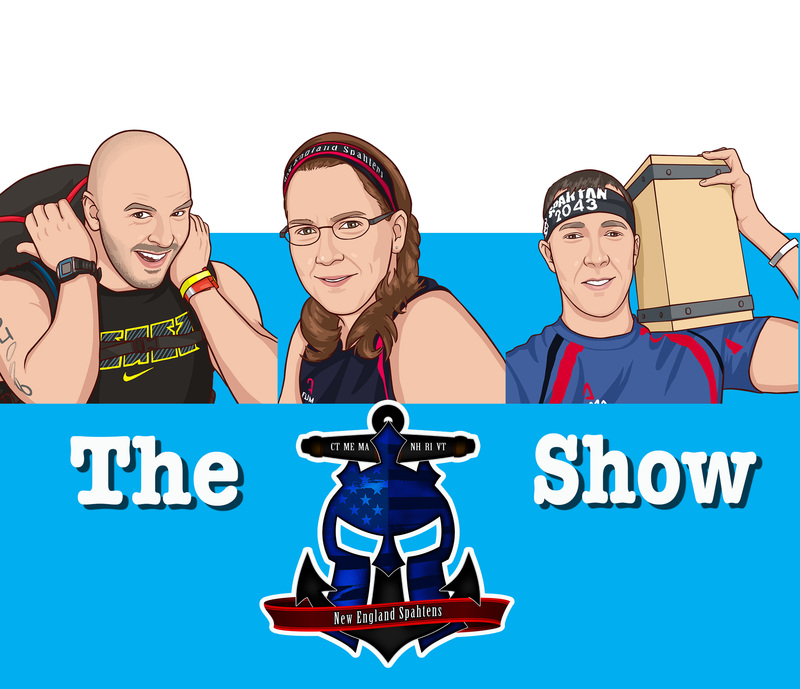 Don’t forget to subscribe in iTunes or Stitcher, and leave us a review so others can find the show later! We also launched a dedicated Facebook page for the show, to track everything in one place – hit Like! Big thanks to NES Ambassador Dennis for this review! 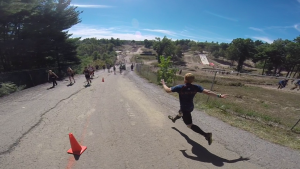 It’s no secret that Rugged Maniac is my favorite race series. It has been around awhile for good reason, it’s FUN. I should say right here at the beginning that I skipped a few obstacles due to an injury, but was still able to do many. 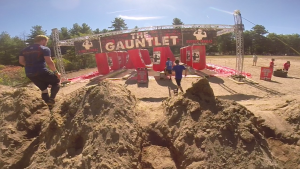 The venue for the event is a motocross track in Southwick, Ma. There is plenty of parking, so no bus rides. Parking is $10.00 per car. I did hear about a couple of incidents where the volunteers parked cars in such a way that people were blocked, this really should not happen and I’m sure will be addressed at future events. There is NO FEE for spectators and the layout of the course allows for many great spots for your friends and family to watch. Registration is pretty straightforward, go to any table and you are assigned a bib number. There was a an backup on Saturday but the staff put all hands on deck and cleared the backlog in plenty of time for people to enjoy the rest of the day. 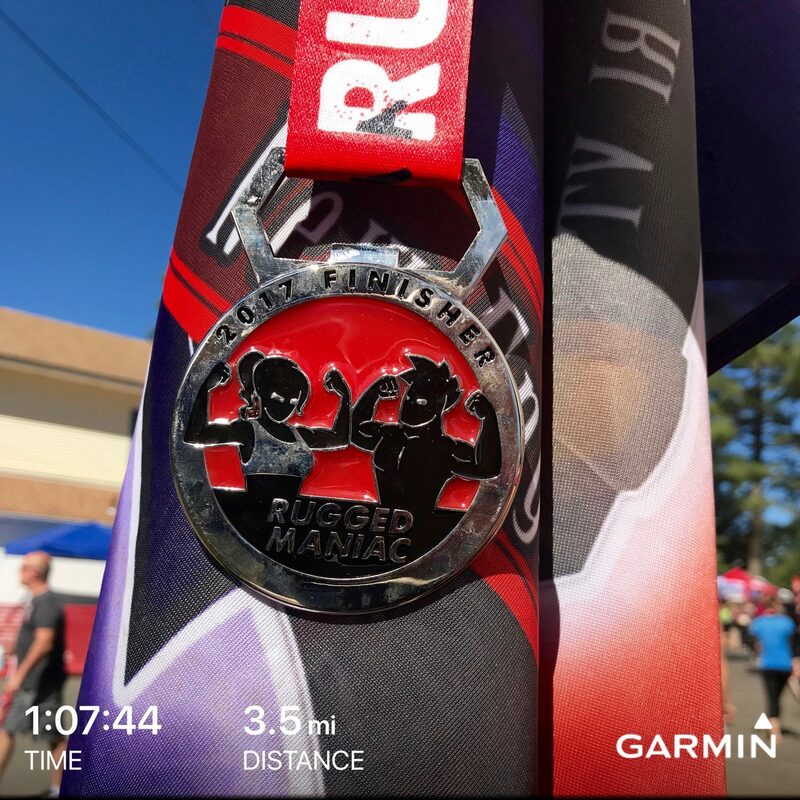 Rugged Maniac does charge extra if you want to be timed, if you were one of those you were directed to another table to pick up your timing chip. Honestly, if you do want to be timed, be certain to sign up for the first or second wave. There are sometimes backups at a few obstacles as the day progresses. Most of us what have done more than 1 or 2 of these events don’t even bother with the timing chip. Remember what I said about it being FUN. Bag check is free and is handled well. Volunteers attach part of your bib to the bag, security checks your bag, and then you put your bag away, so you know right where it is. When you leave, security checks your bib number against your bag. If you lost your bib on the course, they were able to take care of it as well. 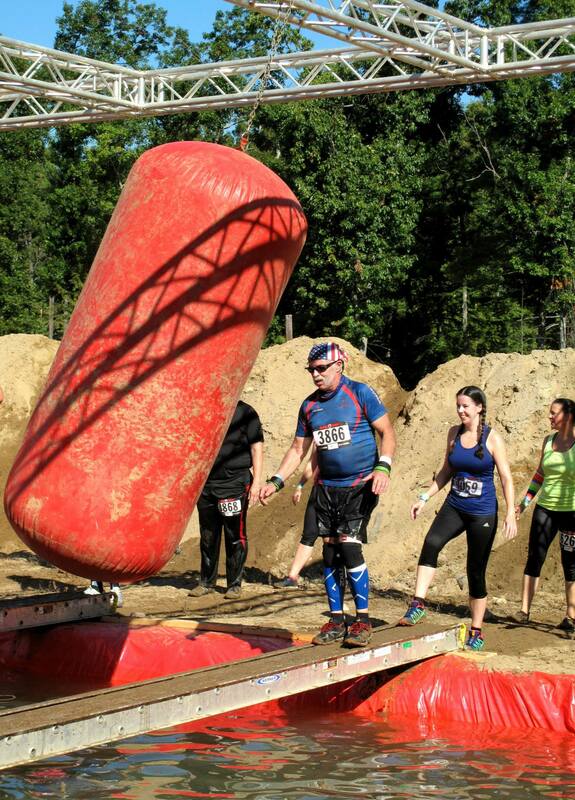 The festival itself, well let’s just say that Rugged Maniac knows how to throw a party. The other thing is that after you do the course, you are not so beat up so you can have FUN at the party. The vendors were either pertinent to the event and were providing enough samples to make it worthwhile or were charities worth supporting. The Marines were there with their pullup challenge once again, and as an old Army vet I was compelled to talk smack. Lucky for them I was nursing an injury. Harpoon Beer was there again this year and this year had a cider offering for those people who prefer that option. There is a bouncy house for the kids that was busy all day long with happy faces. 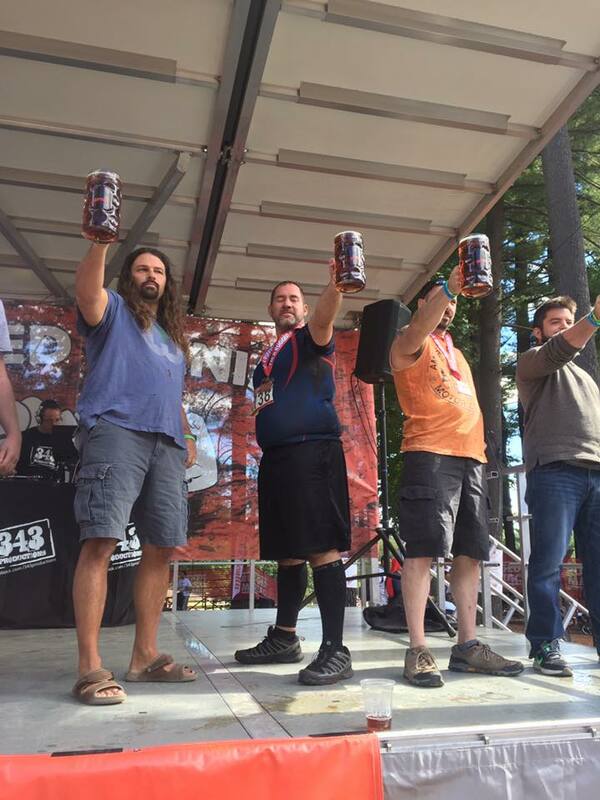 Pie eating and beer-stein holding contests. Food court included some pretty good food, served hot and fresh by the VFW. The “showers”, (cold) were available as well as a changing area. Now let’s talk about the course itself, I’m including the course map so I’m not going to list them all but just say they are well built and some are fun and some are challenging enough to make you feel like you have accomplished something. 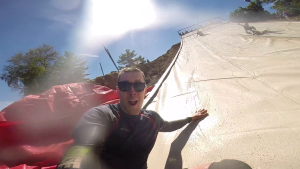 The only backup I saw this year was the Warped Wall and that was maybe 5 minutes. There was one obstacle that more than one person felt was placed wrong. The Ninja wall were so close to a water obstacle that they were very slippery with mud. I saw more than one person wipe out. This year’s finisher’s medal was definitely a step up. The T-shirts had both a men’s and women’s cut. Race pictures were a little disappointing this year. There didn’t seem to be as many photographer’s on the course as in previous years. Overall, this is an event to be on your calendar. I have already signed up. 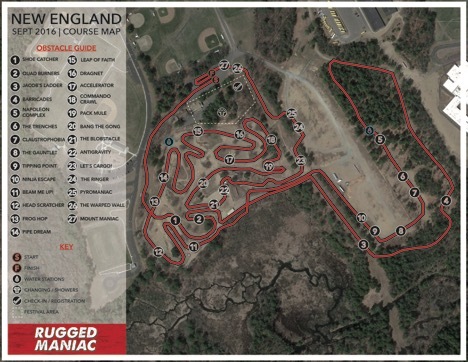 Rugged Maniac was held at Motocross 338, an outdoor motocross/ATV track and terrain course. Seemingly a perfect fit for an obstacle course event as you’ve already got a pre-carved out track, built in obstacles, and a spectator seating. Arrival was easy, as parking was right nearby, organized neatly across the nearby baseball fields (sorry for driving over your pitchers mound!) The standard $10 parking fee was.. well.. standard. The festival area surrounded you quickly as you walked under the cargo net bridge to enter it. Crowds were gathered at the starting corral, as well as the warped wall where spectators and racers alike cheered on runners to get up that slanted beast – the mark of a good festival area is one where everyone feels like they’re part of the event, not just occupying space while they try and keep their eardrums from bursting from some local DJ’s desire to pump techno at 8am. No, Rugged had their festival area well organized, and packed in well enough to be convenient. The layout made perfect sense. Registration table and check in were well done, and here’s why. You show up and sign in, they give you the next bib number in line. 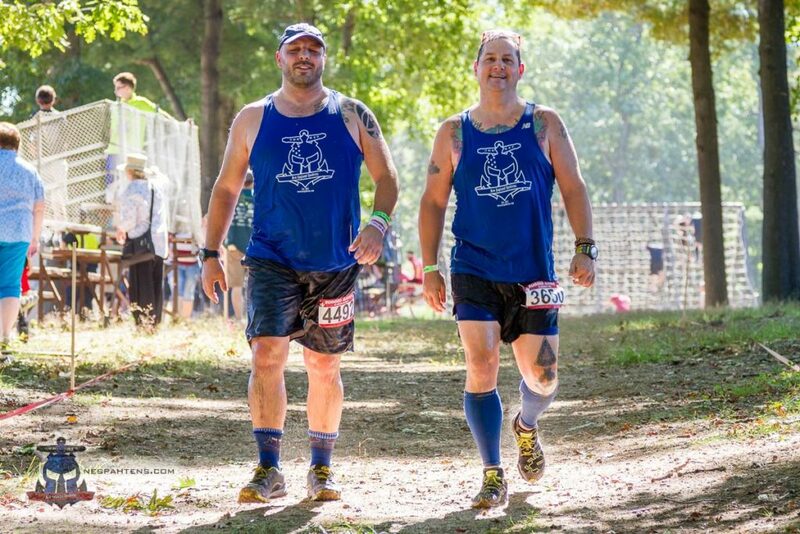 No worrying about getting your bib numbers before the event or bugging your friends on Facebook about why they aren’t posted on the website yet. Timing chips on some pesky little bracelet that you need to bug Mama Hen to trim for you? Nope. A disposable timing tab that you can attach to your shoe, or slip inside your sock. Once I put it there, I immediately forgot about it, that’s the sign of a perfect piece of race gear. Once I was ready to go, I needed to stow my gear – guess what? Bag check was FREE. Self service too. Pop in to drop stuff off. Forget to put sunscreen on, white boy? That’s fine, pop back in and apply! And the best part? Rugged even gives you a clear plastic bag to store all your dirty gear in, so as not to ruin your car on the ride home. Small simple logistical choices by Rugged continued to impress, and I hadn’t even run yet. 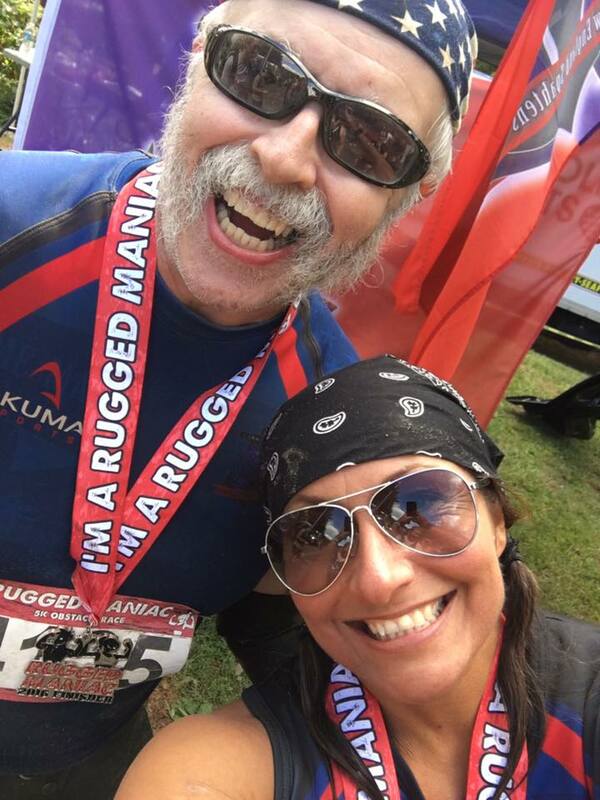 Rugged does both timed and untimed versions of their races. For a small fee, you can run in one of the first waves of the day, and pit yourself against the other racers who paid a very easy to swallow $10, timing fee. I opted for a timed race, as I was interested to see what the competition was like at an event that wasn’t dominated by sponsored athletes and women who could curl my bodyweight. 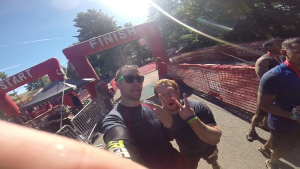 We filtered into the starting corral and were greeted with the typical hype-man intro, motivation music (props to the techno Imperial March track choice), and countdown to race time. I will also add, that your wave started EXACTLY as advertised. They had a clock right at the starting line, and they stuck to it. Punctuality is a trait lacking in this industry. Rugged nailed it. The clock struck 10:30a and we were off. 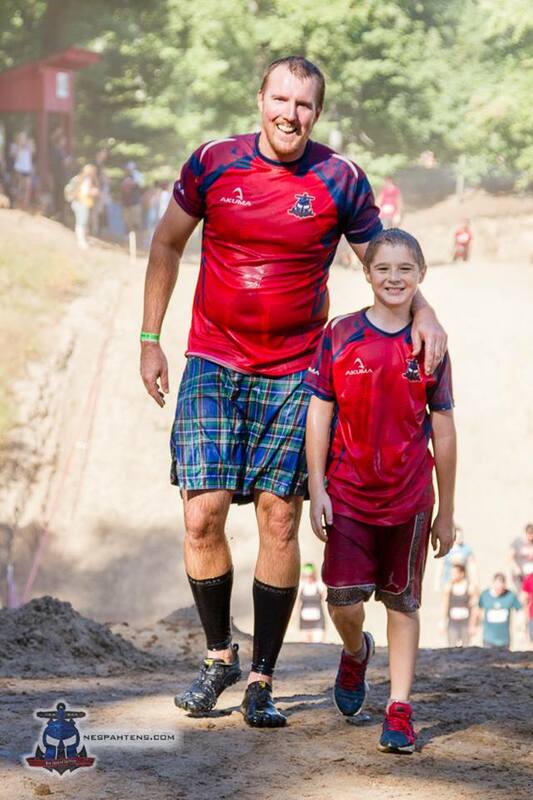 Rugged boasts a 5K course, with 25 creative and fun obstacles. The course they have in Southwick is perfect for this. 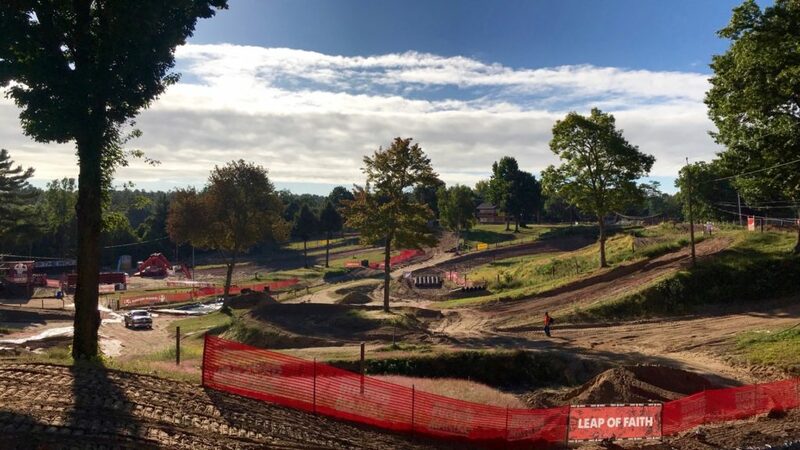 It’s a re-purposed motocross dirt track (it appears to be closed for those events according to their website) so you’re snaking back and forth past earlier and later runners, all while navigating some seriously fun obstacles. Rugged isn’t claiming to be Spartan Race. No huge gimmicky rigs, no giant inflatable mammoths. “Natural” obstacles like rolling hills, dirt mounds, tunnels to run and crawl under, and trails carving through the woods between open areas. Every race has one or two obstacles that others don’t. 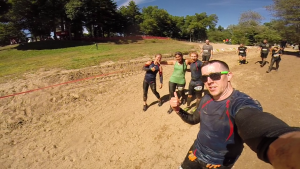 Spartan has the rope climb, Tough Mudder shocks you, but Rugged had TONS of obstacles that I loved and had never done before – obstacles that were more about having fun, than breaking you physically. 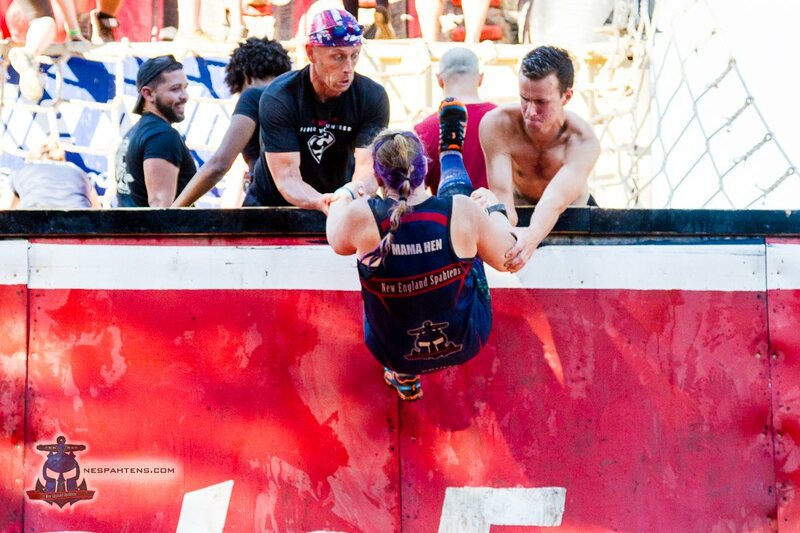 Could it be that this could be a FUN OCR? Inconceivable! Or not – hold on while I jump off a ladder onto a trampoline, up to another ladder! Trampolines are fun! Or, let me run at full speed across these floating platforms! As one woman who was struggling to maintain her balance put it, “He’s like Jesus!” After that, it was jumping over a fire into a huge pool of water, then a giant slide, some barbed wire crawls, a balance beam with huge red balls to dodge, again, all super fun yet not overly taxing obstacles. There was a Wreck Bag carry that was more about proving that you could finish it, rather than questioning whether you should try or not. The hardest obstacle of the day had to be either the swinging rings over water, which claimed a few laughing bodies into the cold water below, or the slick wall, which was part of the final obstacle. Thankfully, with the good natured crowd that was at Rugged, there was always a willing helper, hoisting folks up that struggled. 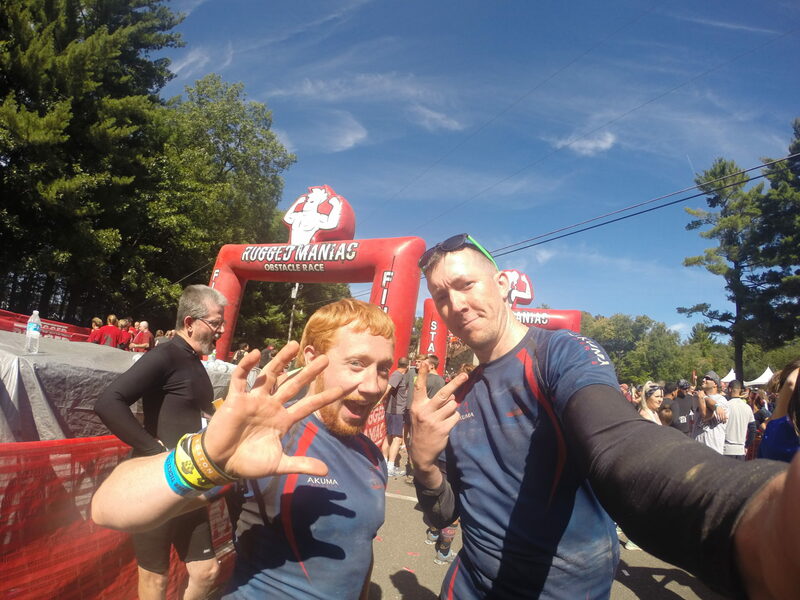 Myself, NES Ginger Ninja – Kevin Grant, and a few others staked out there, pulling folks up over the wall, just enjoying the atmosphere of people succeeding where they had previously had failed. After crossing the finish line at Rugged, I found myself smiling, and compartmentalizing how truly fun the event actually was. I was ready to go again! But first – that age old tradition – post race beers! 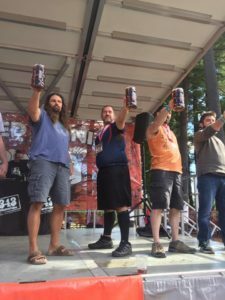 Rugged brings Harpoon beer into their festival, always a solid choice. They also compliment their festival area with great audience participation events such as, jousting, mechanical bullrides, a stein-hoisting competition (Yup – I definitely attempted that one), and all kinds of other things to keep you busy. 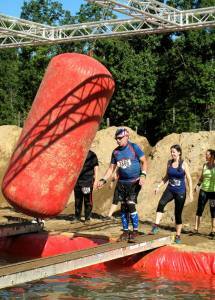 All in all – Rugged Maniac puts on a FUN obstacle course race. After a season of intense races, and a week removed from Killington, it was great to be reminded as to why we run these events – to have FUN. Rugged was a great time, managed by Staff who makes great racer-friendly decisions, and an atmosphere of folks who just want to have the same fun. 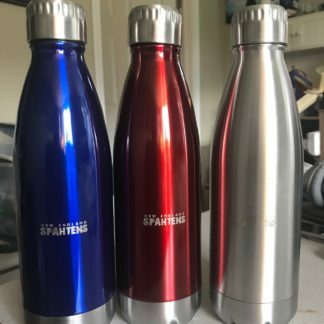 Props to them – this Spahten will be back again. In fact, I already registered for 2016. Did I mention it only costs $39? Yup. See you there. 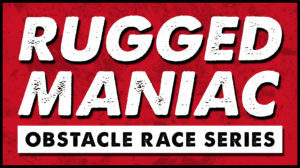 The minds behind Rugged Maniac (http://www.ruggedmaniac.com/) announced a new event series – and it’s causing quite the stir. The Great Bull Run (http://www.thegreatbullrun.com/) is modeled after the famous run in Pamplona, Spain – the one where thousands of people line the streets, and angry, aggressive bulls stampede and run through them – participants have to run, climb, hide or otherwise avoid being gored and stamped to the dirt. The bulls are then put into a bull fight to their death, and participants throw tomatoes at each other. 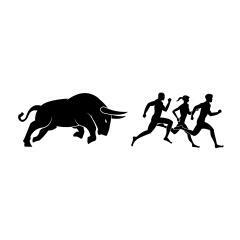 The Great Bull Run wants to emulate this, but with a decidedly “American” flavor. The 12 bulls they plan on using are actually fairly gentled, non – aggressive animals. The course is planned, lined with fences to go under or over, and little alcoves to hide in, and participants are walked the length of the course first. The bulls are not put to the death afterwards (phew). You’ll be killing a small rainforest with the wavers you’ll have to sign. As you can imagine (and as is the original series) this has already proven controversial. On my little slice of Facebook alone, I’ve seen people sign up for this, and I’ve seen people pull out of all Rugged Maniac events entirely. Quite the polarizing reaction to something I’m sure Rugged Maniac thought would be a fun, niche event. On a personal level, I equate this with the deplorable act of dancing circus animals, and don’t plan on supporting it beyond this simple blog post. But how does this sit with you? Do you think Rugged Maniac has dropped the ball on this, or will they find an undeveloped niche event, and tap into a new market? Drop us a comment.